I never have pictures of my business travel but this week I do. 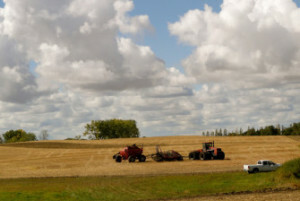 People in this rural area are intrigued that I drive 90 miles one way often to fly out and travel on business. Some think it is glamorous. And those of you who do it often know it is a grind and a lot of work! Last Friday I had the joy of sitting on the runway in Des Moines for four hours before being deplaned and then later reboarding. I got home eight hours late but it felt so good to be HOME. 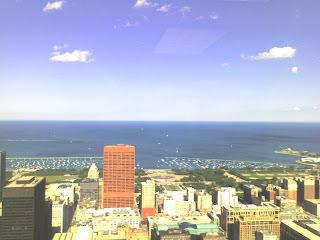 A picture from taken on my phone this week…the view from a client’s conference room in downtown Chicago. A good day to be in Chicago! Ah yes…I spent a few days last week in Des Moines, Iowa at the fabulous World Pork Expo. My co-worker and friend Erin documented our experience and sent me these pictures. They are quite entertaining. Look closely–this man was walking ahead of us…and it is not a costume. Yes he has bare feet. This woman was feeding her show pig marshmallows. At the trade show portion…this young boy was about Hunter’s age and was sporting classic attire, work out shorts and work boots.